The second blog in our Guatemala Blog Series by Jur Schuurman is out! Land tenure in Guatemala is characterised by high inequality. 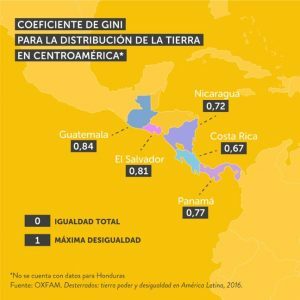 A recent report published by Oxfam International listed the Gini coefficients for land distribution in all Latin American countries; the data for Central America show that Guatemala has the highest Gini value, which is to say the most unequal land distribution. How come? And why is it so much lower in Costa Rica?